Truthfully there is no best tent. All of the tents have a unique aspect about them but none of them are any better than the others. Locals prefer the less known tents while college kids like the Hofbräu. No matter what tent you are in your going to have the time of your life. Just don’t drink too much and take some pictures so you remember it! Here is a guide of all of the tents at Oktoberfest in Munich. Seating 5,830 inside and another 1,600 outside, Armbrustschützenzelt is one of the big tents of Oktoberfest and is famed for its crossbow competitions, held every year since its inception in 1895. Of no surprise, the tent is frequented by members of local Bavarian shooting clubs, and serves refreshing Paulaner brews as well as German favorites including roasted chicken, schnitzel and bratwurst. Armbrustschützenzelt is a huge tent that’s nice and hot when you first walk in. It is a hard one to get reservations with, but if you’re able to get a spot definitely don’t pass up the opportunity! Certainly one of the larger tents, Augustiner seats 6,000 inside and another 2,500 outside. Considered one of Oktoberfest’s friendliest tents, Augustiner is also Munich’s oldest brewery, established in 1328 and is one of only 4 breweries still in German hands. The Augustiner Brau beer is served from individually tapped wooden kegs rather than stainless steel vats, making for the epitome of a true beer-drinking experience. Augustiner is also kid-friendly and Tuesdays is kids day. One of the most comfortable tents at Oktoberfest, Fischer Vroni is the place to go to enjoy an authentic grilled “fish on a stick” along with a nice cold Augustiner beer. You can actually smell Fischer Vroni from about 100 meters away, its coastal scent letting you know you’re close. The tent seats a modest 2695 inside and another 700 outside, and you’ll find a steady older crowd along with a sprinkling of fish-loving Norwegians and Aussies. Fischer Vroni first came to Oktoberfest in 1949 through the famous fish wholesaler Karl Winter. The fish preparation in itself is quite the experience: the fish are skewered on a stick, and grilled in a row that’s over 40 feet long. Regardless whether walleyed pike, white fish, or salmon trout…you’ll find the right fish if that’s what you got the munchies for. Though dinner reservations are nearly impossible to obtain at Fischer Vroni, grabbing a seat during lunch on weekdays is generally doable. Be prepared though – you might come out smelling a bit fishy! One of the more hip tents of the festival, Hacker-Festzelt sports a rock band instead of traditional brass band. Cagey Strings Rock’n’Rock B and Kirchdorfer Musi keep the vibe going all day and night, and probably helped the tent earn its nickname as “Himmel der Bayern” (Heaven of Bavaria). Hacker-Festzelt seats 6,900 inside and 2,500 outside and serves Hacker-Pschorr brews and is easily spotted by its 13,000 square foot mural painted by Rudolf Reinstadler. Craziness. Pure craziness. Get ready for good times when you go into the Hofbräu-Festzelt. Much like its sister establishment, the Hofbräuhaus in nearby Marienplatz, the Festhalle has a reputation for attracting those looking to bring down the house (or Haus). In fact, if you’re ever in Munich and you want a little taste of what Wiesn is all about, we recommend you sampled the world famous Hofbräuhaus! The inside of Hofbräu seats 4,500 and another 3,022 outside and is the only beer tent at Oktoberfest that will serve you a cold beer without being seated! That’s right—Hofbräu has standing tables where you can order from waitresses. We have a decade long relationship with the Hofbräu Tent, and would be happy to help with reservations! Named after its proprietor Michael Käfer, the Käfer’s Wies’n Schänke is one of Oktoberfest’s coziest upscale tents, seating a mere 1,000 inside and 1,900 outside. The tent prides itself in its fine (and pricey) cuisine and Paulaner beer. The tent has more of a restaurant feel to it than the typical tent atmosphere, and the beer garden courtyard has a ‘members only’ feel to it, which goes a long way. The biggest claim to fame for Käfer is that while most tents close around 11:00 every evening, Käfer keeps going for another 2 hours. You’ll hear local bands including the Alpen Yuppies, California Sun, and the Speedos and you can’t help but enjoy the intimate, relaxed atmosphere. The Lion is loose! This tent is a great place to enjoy yourself during Oktoberfest. The beer is great and the people are pretty friendly. Bavarians pass along their rights to their Wiesn Beer Tent Reservations to their sons on their deathbeds. If you haven’t been booking with them for 20 years, they won’t even think about giving you a reservation, so please, there’s no point in asking about getting a beer tent reservation here. 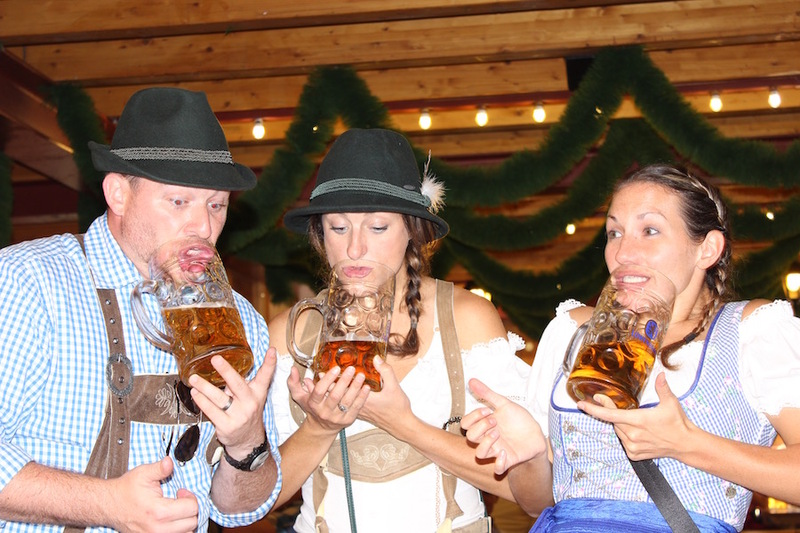 Of course, you don’t need a reservation to have a great time here at Lowenbrau (pronounced “Loofen-brau). Getting in isn’t a cinch, but it’s worth the wait that you might have on the weekends. It’s easy to find this tent because you’ll see and hear the huge lion that towers above Oktoberfest. Look for the lion. You can’t go wrong! The Marstall blends tradition with modern-day style, where upscale cuisine and top-class service rub shoulders with traditional Bavarian hospitality. To lively brass band music, we serve freshly poured beer, but also fine wines; the menu offers regional specialties as well as sophisticated cuisine. The Marstall is a stylish setting for celebrating, seating over 4,000 guests – 3,200 inside the tent and 1,000 in the beer garden. Traditional Bavarian music is played from 12 am, setting the scene for homely celebrations. From 6.30 pm every evening live party music steps up the mood, and the party in the Marstall continues until the Oktoberfest closes at 11 pm. The first thing you’ll notice when you walk into Ochsenbraterei is a huge ox on a spit. If you go in the early part of the day, the ox has quite a bit of meat on it, but within a few hours it will be nothing but bones and it’s time to throw another ox up for the next round of hungry Oktoberfest patrons. Ochsenbraterei opened in 1881 by butcher Johann Rössler who started the tradition with his own specially designed roasting machine, the “mechanical ox rotisserie.” Roasting an entire ox at once was a feat to be seen, attracting spectators in droves. The contraption consisted of two main parts, a “locomobile” mounted on four iron wheels, and a rotisserie with a revolving spit, creating an enormous racket and belching clouds of smoke over the Fest. In 1980 Ochsenbraterei was taken over by Späten-Franziskaner-Bräu, the brew now served in the tent, which has grown to seat 5,900 inside and another 1,500 in its outdoor beer garden. Named after the daughter of the original brewery owner, Braurosl has been managed by 7 generations of German. According to the story, the original owner’s daughter, Rosl, rode her horse to the beer tent, and there is a painting of her inside the door. The tent seats 6,000 indoors and 2,200 outside and serves Hacker-Pschorr brew. During Oktoberfest, a brass band and yodlers provide musical entertainment as well as the sounds of Ludwig Thoma-Musicians and Sudtiroler Spitzbuam. When Michael Schottenhamel constructed a little tent in 1867 that barely held 50 people, he probably never imagined that a century and a half later his humble beginnings would result in a gigantic structure holding 10,000 eager beer drinkers. In 1950 Schottenhamel gained even more fame by becoming the location for the official Tapping of the Keg on Opening Day of Oktoberfest. The tradition was initiated by mayor Thomas Wimmer in 1950, and now every year the festival kicks off with the cry “O’Zapft ist!” and the first Mass is given to the Bavarian prime minister. During Oktoberfest, politicians, tourists and celebrities alike gather in the Schottenhamel tent. The traditional students’ associations also have their special area in the tent were they meet every day. Schottenhamel generally caters to a hip, affluent crowd while still being predominantly German rather than touristy. In addition to the standard half-chicken, you can find culinary specialties such as their giant turkey leg as well as Spatenbräu beer. For all of you wine lovers, don’t despair — wine is still available at the world’s biggest brewfest. Weinzelt (literally “Wine Tent”) features 15 different Nymphenburger Sekt Wein, sparkling wines and champagnes as well as a Paulaner Weissbier. In true Oktoberfest tradition, bands provide entertainment throughout the day and night. Weinzelt seats 1300 inside and 600 in their outdoor wine garden. One of the best places on the grounds to enjoy a cold Paulaner brew, Winzerer Fähndl can’t be missed with its landmark beer stein perched atop the tent. Regarded as one of Oktoberfest’s more elite tents, it is frequented by local guests and celebrities, including members of the FC Bayern football (i.e., soccer) team. By day you’ll hear some of the best Bavarian concert music around and by night you’ll hear lively tent music by the band Die Nockherberger. Winzerer Fähndl offers a variety of fine cuisine including cheeses and snack dishes, a selection of sausages, and a choice of traditional duck, veal and vegetarian and dishes. Not a small tent by any means, Winzerer Fähndl seats 8450 inside and 2450 outside. If you’re looking for a good place to eat in an authentic Oktoberfest atmosphere, Winzerer Fähndl is the place for you.